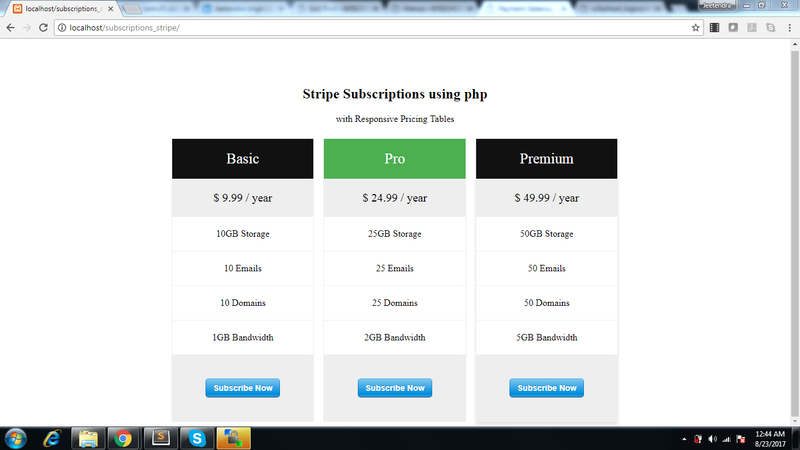 In This blog article i am going to explain about STRIPE SUBSCRIPTIONS USING PHP and making available the source code also. 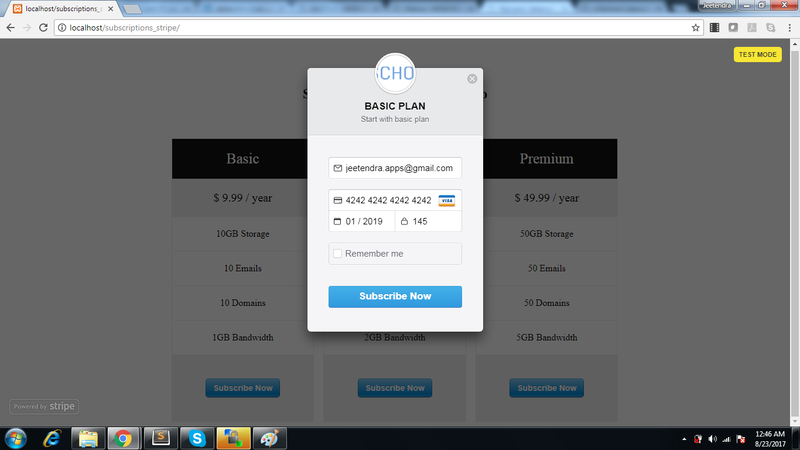 by extending this code you can make a complete subscription management script. i am going to create a pricing table where 3 type of plans are defined that plan will create on stripe if plan not exists on stripe panel and then create a customer and create a subscription in that customers reference. Note: the Stripe account is the pre requisite for you , where we will require stripe publishable key and secret key. and the stripe php library will be require for including in config file so dont worry about the stripe php library it will be available in full source code download of this article. Note : here you have 3 plans listed with different subscription plan and data(like plan name,plan price,plan interval [month/year/week/day] and currency) which are defined in hidden fields in every stripe form tag inside every pricing options. Note: this is completely Free script. Hi I am currently in the process of building my first application and am wondering if this will work for paying employees instead of receiving money from subscriptions. Hi I have downloaded and trying your example code but I seem to always end up going in the catch statement saying invalid request I am using the test cards Stripe give what am I doing wrong? Do you guys have an example code to create a customer using stripe? hello nathan, I change it … but I have the same error. I push the code online, but I have the invalidrequest error. You have change only this value ?